I know, I know, another robot. But this one is red and pink! After I finished this one I started thinking about stylization and abstraction... what it takes to recognize a stylized object. A knitted robot eliminates one level of recognition, since it's not hard and metal or plastic... how about a pink knitted robot? I was concerned that my fellows may stop being recognizable as robots once they're rendered in warmer, more natural colors. But then I was distracted by something shiny and that was that. 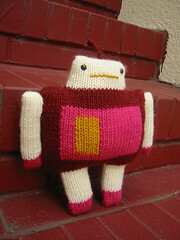 I continue to knit robots for the Plush You! show at Schmancy in Seattle. 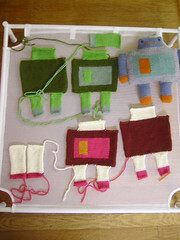 Here's a photo of them on the drying rack, blocked and ready to sew up. As you can see, I knit them flat... and put off the seaming. It's my least favorite part, I guess that's one of the reasons I knit toys on double pointed needles and circulars almost exclusively. No seams! Also, because it's fun. Tim asked me to knit a two-headed baby because that's Double Fine's mascot. And I said sure why not. And there it is! They make videogames over there at Double Fine. And comics, too. And joy. Snug as a bug in a rug. Here's my submission for this month's Month of Softies over at loobylu.com. 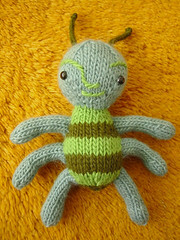 He was knitted on size 8 dpns using Lamb's Pride Worsted. He's kind of freaky but we love him. I am so pleased with this toy I bought at a thrift store in Palm Springs, the town where Jeff and I spent most of our honeymoon last week. I especially love the odd keyhole-shaped body, I have been planning to knit a fellow with this general shape for a while. No time like the present! 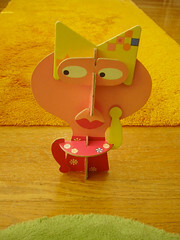 The toy is from the early 60s or late 50s, and it consists of heavy pieces of cardboard that can be fitted together in all sorts of ways to make a free-standing person-like object. It's called Mix Nix, and it was made by a company called Amsco. I love the colors and the shapes, and it was only a buck! I saw it in the vitrine at the counter under a whole lot of stuff and knew it was mine mine mine. Before thrifting in Palm Springs, Jeff and I stayed at the lovely Madonna Inn in San Luis Obispo, in the world famous Caveman room. There are no words. We stayed at the Chase in Palm Springs, which is a really great little 50s motel, but not in the kitschy "stuck in the 50s!" kind of way. It's a very relaxing place, with an amazing salt water swimming pool. On the way to our next stop (Bakersfield) we ate lunch at the Wheel Inn in Cabazon, and hung out with the huge huge dinosaurs that Claude Bell built. They are really quite large - they're the dinos in Pee Wee's Big Adventure, remember those? One of them has a gift shop/anti-evolution information center in its belly. Um. We were in Bakersfield to visit the Crystal Palace, where country legend Buck Owens plays every Friday and Saturday night. After the show, which left us a little sad, frankly, we went over to the karaoke lounge at our hotel, where I sang "It Wasn't God Who Made Honky-Tonk Angels." It seemed appropriate. You can look at some photos of our trip on Flickr, just click on the photo at the right to get to more of my photos. I promise this is the last wedding-related post. I'm all about the knitting of toys from here on out, honest! Originally uploaded by Rain Rain Rain. In case you are planning a wedding or another big party, or you're just curious, here are the nice lovely things Jeff and I did to snazz up our reception. We bought some wedding books to help us plan & design everything but most of this stuff just came from our heads - and a ton of research. *The roses came from 2G Roses, a local-ish rose grower in Watsonville, CA. Buying roses directly from the grower saved us tons of money - and we were able to have so many beautiful fresh roses. They just sent them to our hotel in Las Vegas. The downside is you have to cut them and arrange them yourself, which I actually found sort of relaxing. 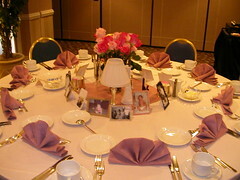 The roses we used were Orlando (hot pink) and Sweet Akito (light pink). We put them in thrift store pressed-glass vases, et voila. *My friends Jen & Dallas had a slide show of their baby pictures at their wedding. I thought that was a fab idea, but I decided that rather than project the photos, I'd print them out, glue them onto posterboard, hot-glue braided ribbon around the edges as a "frame", and put a piece of posterboard on the back to stand them up. In addition to our baby pictures, we had photos of our family members, many of which were decades old (and one from 1855!). We put them on the tables, around the roses. These were a great success - it gave folks something to talk about (and laugh at) during the cocktail hour. *Our favors were tiki mugs from the Flamingo, the hotel/casino where the wedding & reception took place. Once people grabbed their mugs and set them on the table, it gave the whole place a sort of vintage/romantic/tropical flavor. My main design idea was that it should look like a living room - and it did. But it a good way. *The place markers and menu were hand-written on some nice textured card stock from Flax, a local art store. *My veil was made using a comb from Claire's boutique and a yard or two of pink tulle from Discount Fabrics. I bought a book on how to make veils ("I Do" Veils...So Can You!) - it took about an hour to do, and came out well. I wanted a very sixties poufy veil and I got one! So yes, it's possible to have a very sweet and personal wedding & reception in Las Vegas. It took a lot of work on our part, but I really wouldn't have had it any other way - making stuff is how I show how much I care about people. Jeff and I knew that personalizing our wedding and reception in that way would show each other, and our guests, how important they are to us. Thanks to Rain for the photo - there are more at her Flickr site. 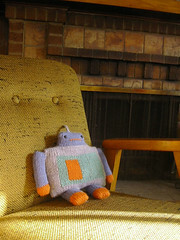 I knitted a new robot. This fellow is bigger than the previous robots I've made - and tubbier, for some reason. I am especially pleased with his thoughtful expression. It continues to amuse me that a mess of yarn and some plastic eyes can have personality, I guess that's why I keep making toys. This guy is for the Plush You! show that is taking place in August at Schmancy, a store/gallery in Seattle. They specialize in "quirky toys, collectibles, and original art work", all of which we here at Jess Hutch Crafts can get behind. I'm excited to take part in the show, which will feature stuffed creatures by artists located all over the world. Lovely! More pics of this fellow (who I am calling "the tubby robot" to distinguish him from his svelter predecessors) can be found on flickr.